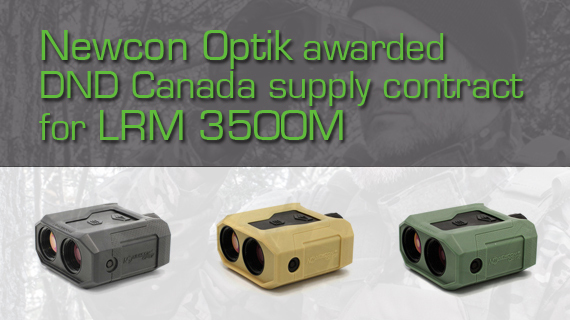 NEWCON OPTIK is proud to announce that it has been awarded an important Department of National Defence (DND) supply contract for its state-of-the-art handheld LRM 3500M laser rangefinder monocular. The initial delivery of rangefinders will provide FOO/JTACs with advanced mission capability requirements and will serve as an additional sensor platform for Canada’s Integrated Soldier System Suite. This most recent award builds upon continued success in international defence and security markets as elite military and professional users increasingly turn to NEWCON OPTIK as the supplier of choice for their precision targeting needs. NEWCON OPTIK’s LRM 3500M is a fully MIL-SPEC, Made-In-Canada laser rangefinder monocular with a crystal-clear 6.5x magnification, etched mil-dot reticle and in-built compatibility with ballistic computers and mapping applications. Building on decades of experience in the design and manufacture of military-grade laser rangefinders, NEWCON OPTIK ensured that the LRM 3500M incorporated unsurpassed capabilities such as a 5.5km distance capability, internal compass and inclinometer, Bluetooth™ wireless communication and advanced interface protocols for use with modern defence GPS and smart soldier systems. The LRM 3500M can accommodate an optional internal GPS for both user and target location, as well as advanced artillery fall-of-shot software. Weighing only 460 grams and small enough to fit in a pocket, the LRM 3500M is the ideal solution for military and law enforcement customers seeking a compact, accurate and reliable rangefinder. NEWCON OPTIK, a world leader in the design, manufacture and supply of military-grade electro-optical equipment, is a proudly Canadian, Toronto-based company. Since 1992, NEWCON OPTIK has been trusted by military, law enforcement and commercial end users in over 70 countries to supply cutting edge laser rangefinders, night vision devices, thermal imagers and tactical optics. NEWCON OPTIK also manufactures several variations of laser rangefinder modules for OEM integration. NEWCON OPTIK is a past winner of the Ontario Export Awards and has repeatedly been named by Deloitte as one of Canada’s Best Managed Companies.